New Designers is a unique and highly reputed graduate design exhibition that takes place every July at the Business Design Centre in London. This event has now been running for 27 years and includes the very best work by the very best graduates from all major design disciplines in Universities and Colleges around the UK. This year over 16,000 trade and public visitors viewed work by 3,500 graduates from 186 design courses. 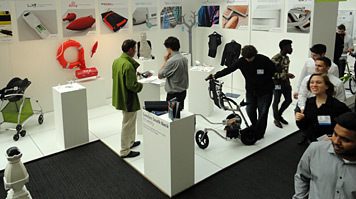 Students from the BSc Product Design and BSc Engineering Product Design courses have exhibited for a number of years and 10 students were proud to represent LSBU this year. In past years, LSBU graduates have been recruited by internationally renowned companies such as Dyson and Hasbro. This year also proved very exciting for a number our exhibiting graduates. DCA invited Paula Wood for an interview while Aariel Forbes has been asked to go for an interview by Heatherwick Studio who designed the world famous Olympic Torch. In addition to enhancing students' employability prospects the chance to exhibit at New Designers is a great motivator and encourages students to do their best during the final year because places are limited. The exhibition also includes a special Schools' Day, which is an excellent opportunity for teachers and their students to learn about our design courses and to talk to our graduates face to face. A number of school students have joined the design courses as a direct result of visiting the exhibition. This year LSBU also recruited students wishing to change career and discipline so all in all it was both very enjoyable and highly successful event.